Get those keys out of the junk drawer and onto the crafting table with these five geeky ideas. All images by Lisa Kay Tate. Tarnished, old junk drawer keys. Nobody can remember where half of them came from, much less what they actually unlocked in the first place. Yet, no one wants to be the one to get rid of them. Some keys are relics from past homes, vehicles, or school lockers, while others are attractive-but-unnecessary family heirlooms tucked away in shoeboxes or desk drawers. An old locker key on a chain can become the perfect Whovian accessory. These crafty uses for keys of all shapes and sizes, from easiest to more advanced, will give these keys a chance to be useful again—by opening the doors to imagination. These are great additions to a Doctor Who-themed room or can be an easy gift for a favorite Whovian. 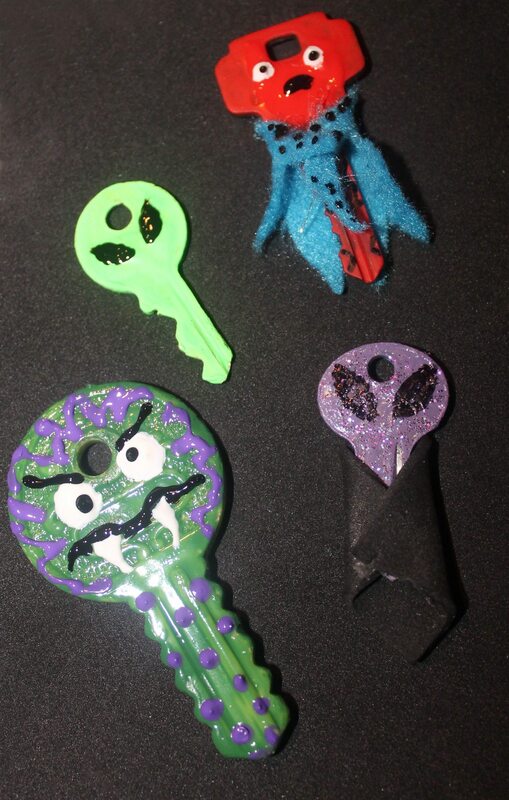 Keys of any shape and size can become little alien and monster charms. Alien and Monster Charms. Using glossy craft paint, spray paint, or novelty nail polish, paint some plain keys bright colors. Then, paint “Roswell” Alien eyes or monster eyes and teeth. They look cute on their own, but they can also wear a little “cloak,” using a square of felt or craft foam. Use these little guys for necklaces, earrings, or bracelet charms. These also work with plastic baby’s teething ring keys for “Baby’s First Christmas” tree trimmers, mobiles, or gift wrap accessories. The flying key replica from Harry Potter and the Sorcerer’s Stone takes only a pair of vellum paper wings. Hogwarts’s Flying Keys. You can make the flying keys that guard one of the entrances to the Sorcerer’s Stone hiding place in the first book of the Harry Potter series. Just take various shapes and sizes of skeleton-style keys and add “wings.” Fold a piece of vellum paper in half and cut into wing-shaped pieces. Then, glue them onto keys to make simple wings. These can also be made into a mobile, by hanging them from plain wooden dowels or chopsticks. However, a single key hanging near a door or window or placed on a shelf can be a nice subtle touch to a library. Steampunk Snowflakes. Arrange six to eight decorative skeleton keys in a circle. Using a glue gun, add steampunk embellishments in the center, such as nuts, clock faces, or gears (make sure to glue one on both sides). Steampunk snowflakes will look like you spent a lot of time on them. Although these make great ornaments during the holiday season, they make cute wall or window art year-round. Locke & Key “Known Keys” Replicas. One of the unique things in Joe Hill and Gabriel Rodriguez’s Eisner-winning dark horror fantasy graphic novels is the “Known Keys,” which can open portals to various dimensions. Since it was recently announced at this year’s San Diego Comic-Con, there may finally be a motion picture trilogy based on this comic. In other words, these weird little keys could get pretty popular soon. Creating replicas of some of these keys’ simpler designs is a fun use of over-sized craft keys that have been haunting the dollar bins in craft stores lately. This is the most difficult of the crafts, because it does include a little imagination and sculpting. Polymer clay and imagination is needed for this Locke & Key-inspired craft. Use bakeable polymer clay to enhance skeleton-style keys with designs and symbols resembling some of the more popular keys (Echo Key, Shadow Key, Omega Key, etc.). If the designs are built over the keys, no glue or adhesive is needed. Once the clay is hardened in the oven (the keys can be baked with the clay), use paint or felt-tip markers to add additional designs. There are several illustrated lists of these keys online, as well as a one-shot Guide to Known Keys by Hill and Rodriguez, but it isn’t necessary to replicate the designs perfectly. This last craft is a chance to get creative and come up with original designs. Display them in shadow boxes or on bookshelves for conversations, or with eerie Halloween displays. LOVE the Emegency TARDIS key, Lisa!!!! Now I know what to get my niece for Christmas! Thanks….and it couldn’t have been easier to make! I have a drawer full of old keys of unknown origin. Love your ideas for how to repurpose them!